Summer fun begins with great recreation. 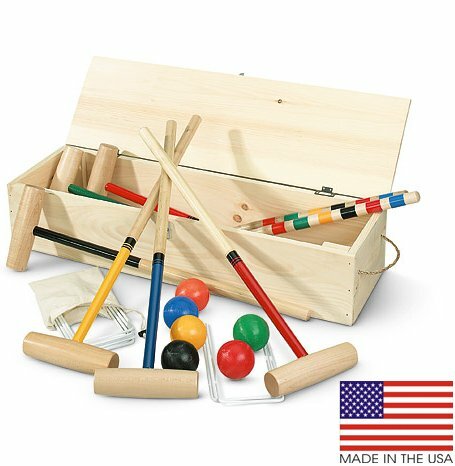 Start a an sporting tradition with Forest Industry's Eastport 6 player croquet set. Tough maple mallets are matched perfectly to the polymer balls while the solid pine equipment case keeps everything safely stored between competitions. Complete instructions guarantee a quick start to the games. If you'd rather roll out your Eastport croquet set, there's always the optional hardwood wheeled stand. Additional information on the wheeled stand can be found at The Croquet Store's Amazon Storefront (see link above). If you have any questions about this product by North Meadow Croquet, contact us by completing and submitting the form below. If you are looking for a specif part number, please include it with your message.